With the game knotted 12-12 going into the fourth quarter, the Dexter Demons had a chance to make a statement. Class 3A’s No. 5 team had, to that point, proven themselves well up to the task of competing with the No. 3 Bears of Estancia. Now, the upset was there for the taking. And the Demons had the ball. The boys in blue marched efficiently upfield en route to the Bear 11-yard line, and with around 10 minutes remaining, junior quarterback Jarren Amaro found Jordan Marquez for the score. Since missing the PAT on their inaugural touchdown, the Demons had been trying to recover precious extra points by going for two, and finally, when it mattered most, they were successful. Amaro fired the ball in to Nick Cobos, and Dexter took the lead, 20-12. Estancia was, of course, not going down without a fight. With help from a long run play that propelled them into the red zone, the Bears completed a touchdown pass of their own with seven minutes left in the contest to make it 20-18. Estancia had been attempting conversions all night, and despite a lack of success to that point, they had no choice but to try again. The outcome would be the same, however, as Dexter stopped the Bears short of the goal line to maintain their two-point lead. The Demons were able to run off a good chunk of clock but could not sustain their drive, and with around two minutes to go, the ball went back to the Bears. Dexter’s defense went into hyperdrive, and it turned out to be enough, as Estancia turned it over on downs in the final moments, allowing Amaro to take a knee. The Demons committed just one turnover on the night to Estancia’s two. One of those turnovers allowed the boys in blue to set the tone early, as a fumble recovery near midfield on the game’s opening drive by Izak Aguilar set up Dexter’s first score, a three-yard quarterback sneak by Amaro. That 6-0 tally would stand until the final two minutes of the half, when the Bears charged in from 15 yards out to make it a deadlock at the break. While Amaro would attempt just six passes on the night, he completed all but one and made them count. A six-yard toss from the junior to Matt Otero with around eight minute to go in the third put the Demons back in front, 12-6, but once again, Estancia responded in the final two minutes of the quarter to set up the dramatic finish. With the Bears also rarely taking to the air — attempting just five passes for 22 yards on the contest — the majority of the bout played out on the turf, which Dexter’s Cobos ruled with an iron fist. 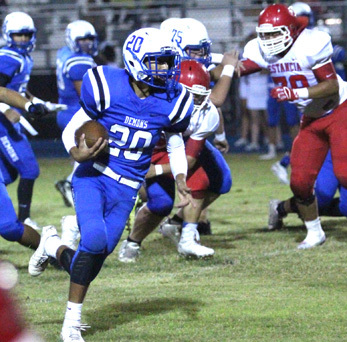 Cobos took the load of the Demons’ ground game — with cohort Gustavo Macias out with a minor injury — and literally ran with it, racking up 220 yards on 20 carries. Amaro finished five of six for 41 yards and two TDs, and was 15-60 rushing with a score. “(Cobos) just had an outstanding game,” said Graham. “And Amaro may have only thrown six passes, but he was very accurate and very productive on them. Dexter will have a well-deserved week to prepare for their District 4-AAA opener against Eunice Oct. 13 in Dexter, and Graham says the squad will use that time wisely. “Beating a quality opponent just puts us headed in the right direction, and now we’ve just got to continue to try to improve,” said the coach. “With the open week, we’ll be able to concentrate on the fundamentals and getting some people healthy that are a little banged up right now, and hopefully we’ll come out against Eunice in two weeks ready to play.